Hello my Loves and Happy New Year!! I'm bring a new look into this New Year with a Rose Gold makeup look. My amazing husband knows me so well, for Christmas he got me the Limited Edition Dose of Colors - Hidden Treasure Palette. 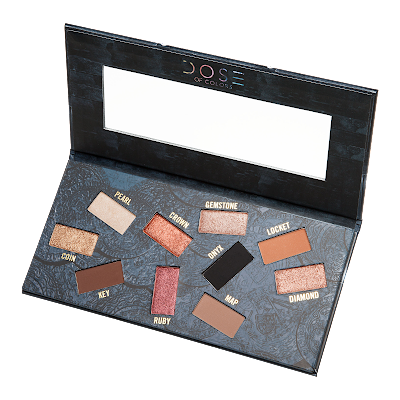 This eyeshadow palette is so gorgeous and pigmented it has a great mix of shimmer foil metallics and matte shades. If, you follow me on my socials I wore this look for New Years Eve. This year I really want to get out of my comfort zone and stretch myself to my limit (we only live once). I've gotten request in the past and present to start a Youtube Channel; if you are reading this I want to hear from you! Let me know if want to watch me! I'm even thinking of doing more short videos on my Instagram. Leave me a comment below, I want to hear from you! I wear Eyelash extensions and this gel liner doesn't disturb your extensions. Beautiful look lovie! That palette is gorg!